Lucknow, February 8: The Uttar Pradesh government on Thursday presented an Rs. 4.79 lakh crore budget for 2019-20, and announced many schemes for the betterment of the states. The annual budget presented by finance minister Rajesh Agarwal in state Assembly is 12 percent higher than the 2018-19 budget of Rs. 4,28,384.52 crore. The budget includes new schemes totaling Rs. 21,212.95 crore. 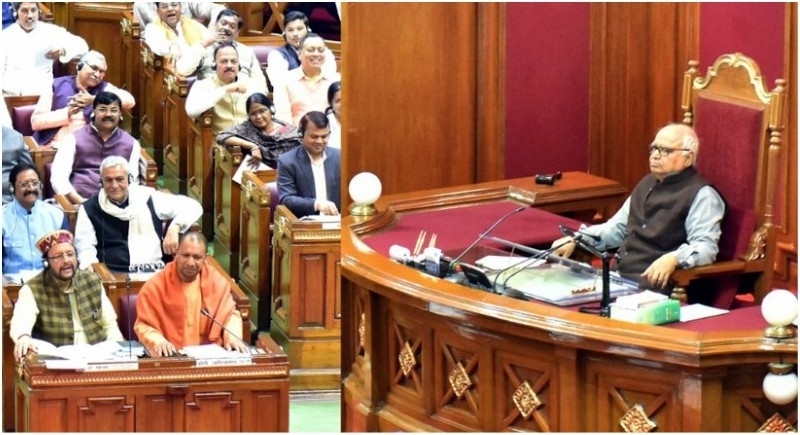 Minister Agarwal announced a number of new populist schemes in the presence of Chief Minister Yogi Adityanath, including "Kanya Sumangala Yojana" to raise health and educational standard of girls, "brighten their future and bring in a positive change in the thinking towards women." An amount of Rs. 1,200 crore has been proposed for the Yojana. For conservation of bovine cattle, the government has allotted Rs. 247.60 crore towards maintenance and construction of 'gaushalas' (cow sheds) in rural areas. A special cess has been imposed on liquor sales in the state. Of the total cess collected, Rs 165 crore will be used for maintenance of stray cattle in the state. Ayodhya got nearly Rs 300 crore for the construction of an airport and tourism-related projects. As much as Rs 207 crore was further provided for the expansion and beautification of the road from the Ganga bank to Kashi Vishwanath Temple in Varanasi. As per the budget estimate for 2019-20, the total receipts would be Rs. 4,70,684.48 crore. The amount includes Rs. 3,91,734.40 crore of revenue receipts and Rs. 78,950.08 crore of capital receipts. The tax revenue is pegged at Rs. 2,93,039.17 crore, including Rs. 1,40,176 crore of the state's own tax revenue and Rs. 1,52,863.17 crore of the state's share in the central taxes. The total state expenditure is estimated at Rs. 4,79,701.10 crore. It includes Rs. 3,63,957.04 crore of revenue expenditure and Rs. 1,15,744.06 crore of capital expenditure. Revenue saving of Rs. 27,777.36 crore is estimated in the year 2019-20. The state's fiscal deficit has been pegged at Rs. 46,910.62 crore in 2019-20. The state's debt liability is estimated at 29.98 per cent of the state's GDP. After deducting total expenditure from the receipts of consolidated fund, a deficit of Rs. 9,016.62 crore has been projected for next fiscal. Net receipts of Rs. 9,500 crore is expected from public account. The closing balance for 2019-20 is estimated at Rs. 8,708.85 crore in which opening balance of Rs. 8,225.47 crore has been taken into account.